Provide factory-insulated premanufactured roof curbs of Style RC-4(use A or B profile as shown on drawings) as manufactured by Roof Products & Systems, at all roof openings as shown on drawings. 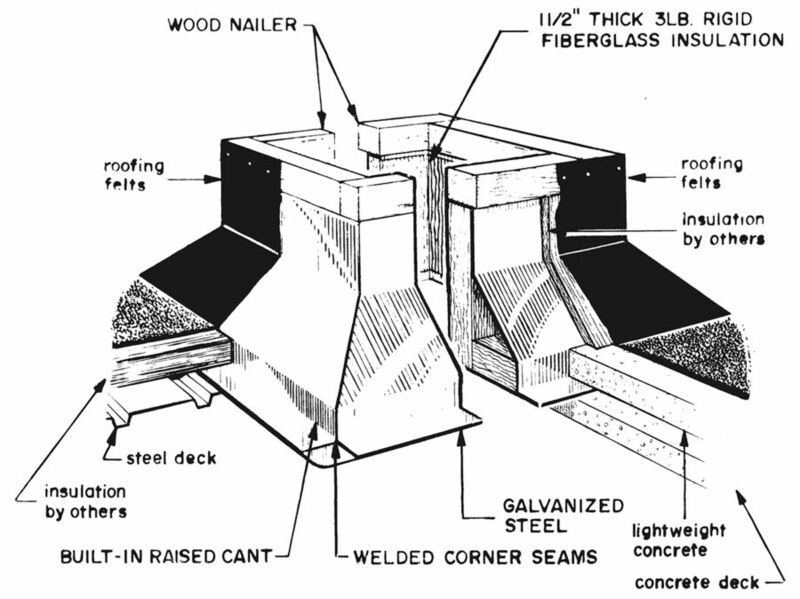 Curbs shall be of box section design with full base plate, 18 gauge galvanized steel with raised built-in cant starting 1-1/2" above base plate or as shown on drawings and extended to fully mitered and continuously welded corner seams, factory installed wood nailer with concealed fasteners, and shall be insulated with 1-1/2" thick 3 lb. density rigid fiberglass board encapsulated top and bottom. Curbs shall include any required internal stiffeners to support specified equipment above. Standard curb height to be 9 1/2 or as shown on drawings and shall accommodate designed deck slope to provide level mounting surface for specified equipment above. Premanufactured curbs shall include all burglar bars, liners, and other options as specifically shown on drawings.